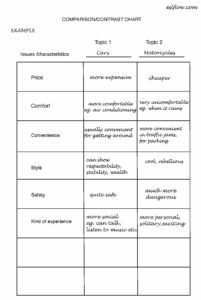 This is a worksheet that introduces students to one method of preparing a topic for a comparison/contrast essay. Click on the image below or the link to download the PDF file. This is a comparison/contrast outline worksheet to help students organize their ideas and plan their essay. The model compares movies and concerts. 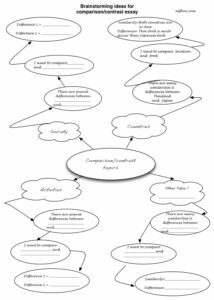 This is a comparison/contrast brainstorming worksheet to help students become familiar with the language of comparison/contrast essays. It also helps them organize their ideas. 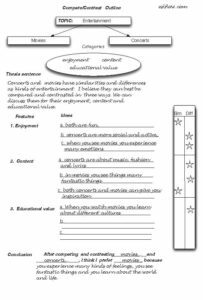 This is a worksheet to help students practice writing comparison sentences and increase their writing flexibility and fluency. This is an elementary exercise to help English language students understand and remember the different forms of comparative adjectives. Students sort the adjectives into the appropriate columns and then write sentences. This is a comparison/contrast essay worksheet. Students have to complete the essay with appropriate ideas. 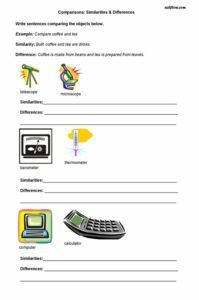 This is a worksheet to help students practice writing sentences comparing similarities and differences. 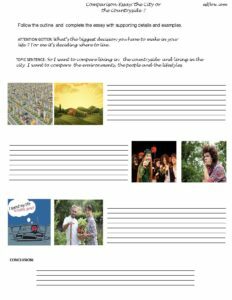 8 Comparison essay: the city or the countryside ?